Charged with the task of choosing and writing about a limited number of her most cogent literary influences for frieze in 2009, a clearly rattled Maria Fusco asks us, her readers, ‘how can I choose between those books that have burrowed into my brain?’ The list compiled, she signs off fairly unequivocally: ‘I’m never doing this again.’ Nonetheless, Give Up Art, the selected collection of Fusco’s writings recently published by New Documents, concretises what must have been a similarly onerous task: what to keep, and what to omit from this collection? What ever to do about the vast range in tone? And, most vitally, given that as a writer Fusco prioritises values of indeterminacy, uncertainty, and declassification, how might a collection of her writings—assuming such books are typically oriented towards unifying or consolidating an author-function—be organised so that these values linger, embodied, in it? 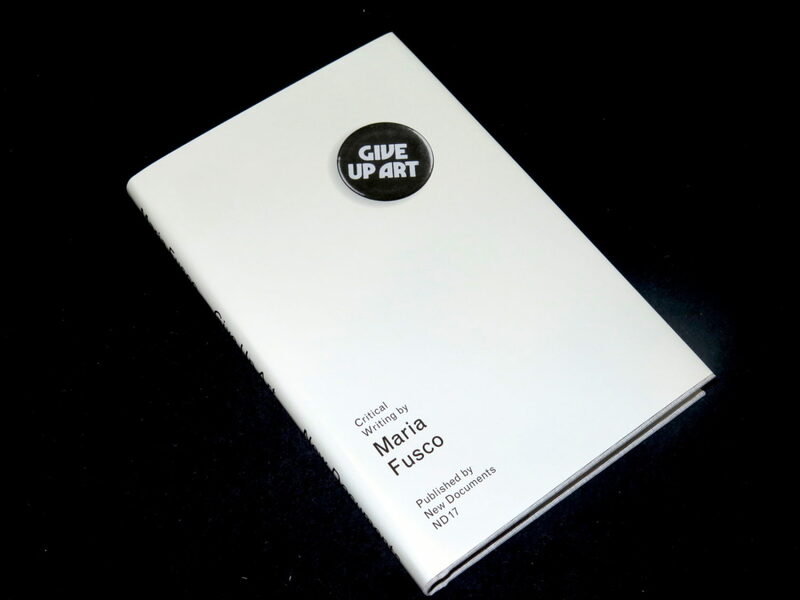 Happily, a determined lack of determination allows all of these questions to spill into the business of reading Give Up Art, which represents only a partial glimpse of Fusco’s work. Over the last few years, Fusco has been publishing non-fiction and short stories, writing film scripts, devising performances inside mountains, and editing the influential art-writing journal The Happy Hypocrite (2008—). All written since 2005, the majority of the texts collected here have been published previously—in books and journals (frieze, Art Monthly, Gorse, etc. 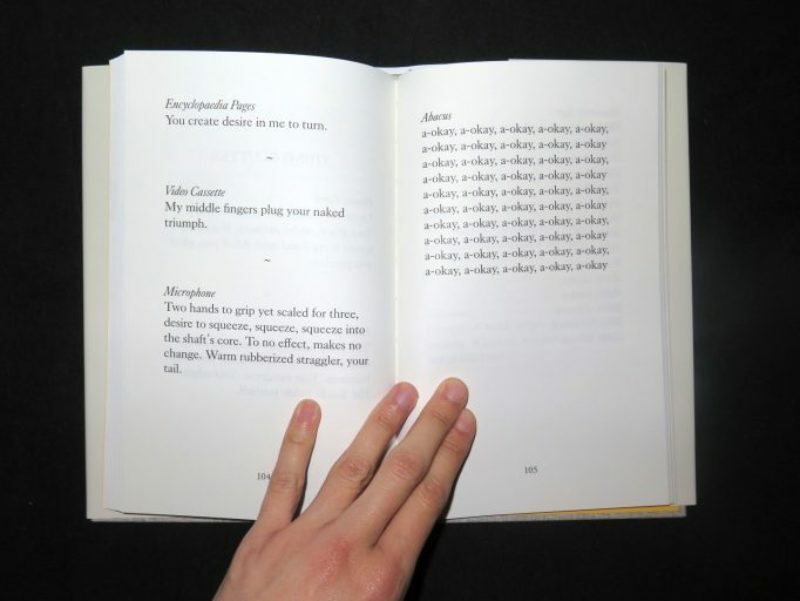 ), or written to accompany or play alongside certain exhibitions (for example, The Persistence of Objects at Glasgow’s Common Guild and Lismore Castle Arts, 2015). This means I had already read a fair few of them. Yet there remained plenty to gain from reading them again: most importantly, because in their fitful synthesis they demonstrate the patent range of invention evident in Fusco’s writings about art. Clearly, this book cannot be entirely hemmed in as art criticism, though it does include straightforward critical texts; neither is it exactly literature, despite bearing a formal ingenuity that makes some of its components equally at home in literary journals. Rather, Fusco’s work demonstrates an exciting alongsidedness: neither, in-between—‘declassification in action, as the start’. 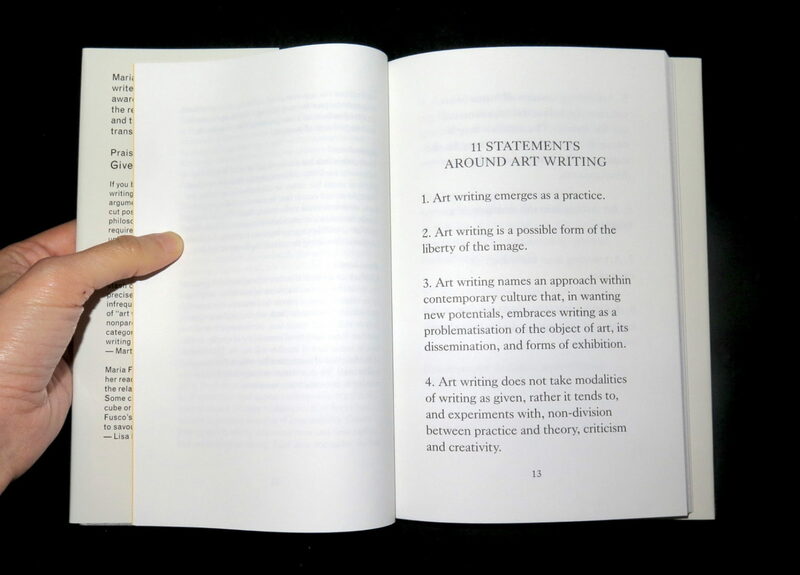 In its performativity, it renders re-publication of the ‘11 Statements Around Art Writing’ (2011)—a comparatively dry and joyless piece of collaborative writing—somewhat redundant. Reading Give Up Art means we already know what it is (show, don’t tell, to use that tired literary maxim). Fusco’s art writing is not bound by the qualifier of overt criticality: it does not stake a claim for itself somewhere outside its object, but caught up right in the thick of it, with art. Both refusing the idea of purity, and eschewing the paranoia of critique  it does not approach art with preconceived notions, seeking the false certainty of proof, but works backwards from it: induction rather than deduction, as she puts it. This is not to be confused with art writing conceived in any vague sense—i.e. all writing ‘about’ art—but rather art writing as a practice, and one roughly continuous with making sculptures or installations, painting canvases or performing. As a consequence, we assess some of the texts in Give Up Art in much the same way as we would an artwork: which is to say, with difficulty. The respective remits of some are fairly straightforward: an interview has a particular, defined format, typically a conversation transcribed; similarly, a review of a film or art exhibition generally starts with that film or exhibition. Being neither fully circumscribed by art-critical nor literary criteria, I don’t think it’s controversial to say that the ‘Notes on Comic Face’—a brilliant short text written as part of Fusco’s longstanding series on the various roles of Canadian actor, Donald Sutherland—is somewhat harder to assess. But it seems to me there is a particular joy in this confusion. Because in reading it, I observe myself coming to it with preordained notions as to what it should be. There is something quite thrilling in becoming cognisant of this unconscious mechanism, only to see it falter. This is not to say that we should all give up art criticism. Despite the capaciousness of what Fusco terms gestural criticism, I still think there is a need for self-evidently critical writing on contemporary art—even if there is a certain futility in that. In her interview with Cosey Fanni Tutti, Fusco nods to ideas of class, claiming to be ‘obsessed’ by it; in ‘Freedom to Starve’ she rightly notes that Steve McQueen’s Hunger (2010) eschews the politics—‘with a capital “P’’’—so essential to any discussion of the film’s specific historical context. Dealing with art’s participation alongside these ideas, which are big and nothing if not real, arguably requires a more direct tack. Perhaps for a lack of imagination, too much cynicism, or both, I am not fully convinced of the efficacy of ‘a frustration with exhausted modes of critical engagement within our elite, cultural world, expressed in writerly form.’ Answering these ideas in riddles, I would think, will only get you so far. Nonetheless, as someone who writes about art, what Give Up Art demonstrates is the benefit of a certain generosity towards art, and in writing, ‘as we read the object critically’. Fusco’s approach suggests a kind of sensual or embodied criticality, emerging somewhere between the eye and the word. For that alone, it is a book to be read and re-read.